I like to grind my own meat in the food processor. I feel I have more control over what I’m using and what the end result will be. These burgers are one of those “Omgosh! Munch chomp chew don’t bother me I’m inhaling something amazing” experiences. Mix all the ingredients together except salt. Add salt right before topping the burgers so the tomatoes don’t get watery. Set aside. 2 pounds Tri-tip steaks, with a strip of fat on the side preferably. Bring the steaks to room temperature. Grind ¼ of them at a time in a food processer, using the metal blade attachment. You’re looking for meat that is shredded without big pieces. Place the meat in a large bowl and add the rest of the patty ingredients. Mix gently with your hands. Press together until it sticks well enough, then press into patties. The trick here is to press enough to stick together, but not to overwork the meat. Make 6 patties. Cook the burgers until grill marks form, flip once and cook until almost done. Top with the fontina & ham and finish cooking. Brush one side of the bread with olive oil. Grill the olive oil side until grill marks form. Place the patties on the uncooked side of a bread slice. Salt the bruschetta topping and spoon over the top of the patties. Top with another slice of grilled bread. Wow! Are you sure this is just a burger? With the blade Jeanine. I'll go write it in right now. Thanks! Thank-you for the comments everyone. You all get here before I even wake up! It's always fun to see what you've written here. Ginger you can't live without a food processor! Nooooooo. Woah, this looks incredible! I've never seen a burger like this, but it's an amazing idea. I bet this would be great with some goat cheese thrown in, too. I am going to have to make this over the summer! 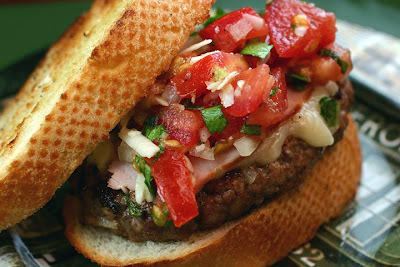 The burgers sound great and I love that bruschetta topping as an alternative to the usual fixings! Me: sir, would you mind grinding this sirloid steak for me? Butcher: why would you do that? you'll waste your money because half of it will stay in the grinder! Me: well, what's in your ground beef? From that day on, I grind my own beef and don't care about the price! Omgosh Marta! I am so glad you posted that, I am further convinced. Wow lol! Laura, why do you torture me so? Hey I was just thinking about you and wondering where you've been! UMMMM... can you please come to my house and make these PRONTO! I am not a big meat eater, however, this sandwich really hit my fancy!! I'd love one for dinner tonight. It looks delicious. I'm thinking about turning your patties into little meatballs for my pasta tonight. That sounds like a good idea Sam. I hope they turn out well. Maybe add some bread crumbs in there? Wow, this look so elegant! These look great! Never thought to do that with bruschetta...will definitely try this!